You all know how much I love my geeky tees; if you’ve seen me around at events, you’ll have seen me wearing some of them (although I also have my fair share of pretty dresses). I can’t resist some of the tees I come across online; I’m starting to run out of cupboard space! I don’t usually like white tees (for obvious reasons), but I’m really digging this one. 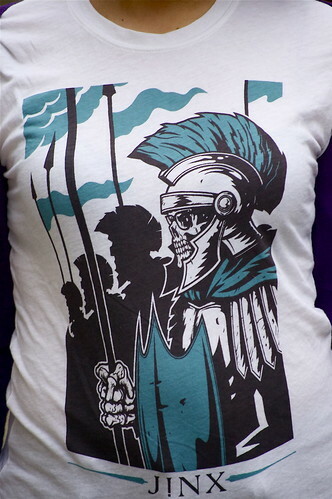 The black and turquoise design is great and I love how it looks paired with my purple top! The tee is a little bit on the thin side and is a tad see-through (you can’t get away with wearing a bright pink bra under this), but that lighter design is perfect for layering. 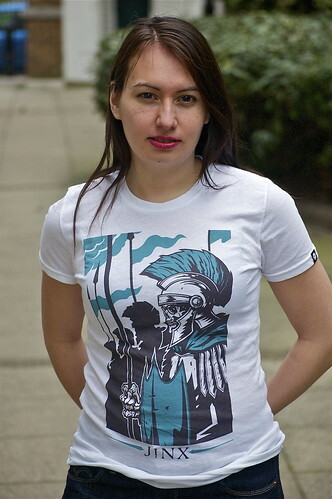 The tee is available on J!NX.com at the moment for only £15 (three different types: girly, guy and guy premium). I’ll be posting photos of the others tees later this week. 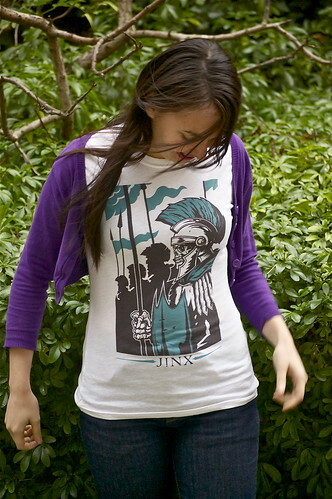 But check out J!NX for more geeky designs!